My name is George C. Huang, and I am a Chief Freedom Officer and a Rapid Revenue Acceleration Specialist at Freedompreneur Coaching & Consulting. For a few years, I had been searching for an application that would allow me to create a quiz, provide instant feedback to the quiz taker, and collect their name and email address. I had tried searching for this type of ideal quiz application a number of times online. Because of that, I have tested a number of applications over the years. Most of them only provided a numerical scoring of quiz results. Others were difficult to learn how to use. I was concerned that I was going to have to hire someone to build a custom application for me. After one particular session of intensive searching, I found your website and QuizMaker application. Before I purchased, I installed the trial version. Then, I contacted your sales and support staff and grilled them with very specific questions. To my delight, I found that your sales support and technical support have been remarkable: prompt, courteous, and helpful from both sales interactions and tech support. This has been over the course of, perhaps, a dozen different interactions, by email, chat, and phone. This remarkable support has continued even after I purchased the tool. I purchased QuizMaker because I found it to be easy and quick to learn to use. Other tools have been a struggle to learn. 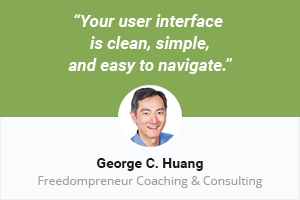 Your user interface is clean, simple, and easy to navigate. I did not even need to wade through your tutorials to produce a quiz product that met my high standards. Your team deserves to know that I have had a good experience. I only wish your product had been easier to find and that I had found it sooner! Do you enjoy using iSpring QuizMaker to create richmedia online quizzes? Share your own success story with us!